kitchen window and noted with pleasure that the sun had come out. It was also snowing fairly heavily. I turned back to the turkey I was stuffing only to realize that I’d lived in New Mexico long enough that heavy snowfall combined with bright sunshine no longer seemed worthy of comment. What’s weird depends largely on your expectations. Back when I was still teaching at Lynchburg College in Virginia, Roger Zelazny came as a guest speaker. I’d told my students they could have extra credit for attending the lecture and writing me a short essay about it. What fascinated me when I read those essays is that every single one of these students mentioned that Roger was wearing jewelry. That jewelry wasn’t extensive – a silver belt buckle and a silver ring, as I recall – but to my students, mostly products of the East Coast, many from New England or New York, a man wearing any ornamentation other than a plain gold wedding ring was worthy of comment. I’ve lived in the southwest for over fifteen years now and I’ll admit that when I fly East I watch as the idea of normal shifts. Facial hair on men begins to vanish (whereas here the majority of my male friends wear at least a mustache, usually with a short beard). Jewelry on men goes away and even the wedding rings get thinner. Women’s clothing becomes more homogenous and more conventionally “feminine.” Jewelry becomes less individualistic. Equally, different environments can make continuing practices that were “normal” a very bad idea. When I started gardening in New Mexico, a friend told me, “You’re used to setting your plants on little hills so they don’t get drowned. Here we put them in hollows so they get enough water.” I thought she was crazy. I rapidly learned she was right – and every year when I dig those hollows for my plants I remember and laugh. Comfort in shifting between perceptions of normal is important for any writer, but I think especially so for those of us who write science fiction and fantasy. When I was writing the Firekeeper books, I learned to slip into the mind set of someone for whom cooked meat was weird and shoes a burden. More importantly, since the books had several points of view, I had to be able to slip into the perspective of a young man who was a bit shy of the aristocracy with whom he now found himself associating, then into that of a young woman for whom that same aristocracy were family and friends. 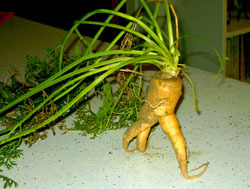 What’s weird? What’s normal? All a matter of perspective. And playing with shifting perspective is something I have come to love. This past Sunday began the Year of the Tiger. 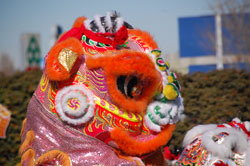 Jim took the picture of this Lion Dancer in 2009. Sadly, Jim and I missed the dances and demonstrations at our local Chinese Cultural Center because he was under the weather. Even so, I still felt festive, because this is “my” year. I’m not sure exactly when I learned I was born in the Year of the Tiger, but by the year I turned twelve (that is, the first Tiger year since my birth) Kellogg introduced a campaign for Frosted Flakes that made certain that I wouldn’t forget. Kid that I was, I felt good about the fuss – even though I was a shy, bookish seventh grader who felt all knees and elbows, not tigerish at all. Even then, though, I wondered about how everyone born in the same year could be said to be the same. It would take the passing of a couple more Tiger years before I got around to learning the answer. First of all, the cycle of the Chinese zodiac is not twelve years, but sixty: twelve Earthly branches combined with the ten Heavenly Stems. In later centuries, the twelve Earthly Branches came to be associated with the twelve animals we all know and love – if from nowhere else than the paper place mats in Chinese restaurants. The Ten Heavenly Stems came to be associated with the five elements. Yes. Five. No typo. The Chinese consider the universe to be divided into five elements: Wood, Fire, Earth, Metal, and Water. I consulted the charts and learned that “my” year is a Water Tiger year. Still, I wasn’t satisfied. Did that mean I was the same as every other Water Tiger? Again, the answer is “no.” Chinese astrology is as complex as its more familiar Western counterpart. Time of birth, right down to the minute, plays a role. When casting a horoscope, you need to adjust for your Time Zone, so even location of birth matters. It’s funny but, although I had similar questions about Western Astrology (my brother and I are both Virgos, both born on the same day, but not twins and certainly no more alike than we are like either of our sisters), I never bothered to learn how to calculate horoscopes by that system. It just didn’t catch my fancy as the Chinese system did. My buddy David Weber has said he’s positive that in another life I was Chinese or Japanese… Whatever, it’s certain that I love the details of what used to be called “Oriental” cultures. That love has had an enthusiastic outlet in my most recent novels: Thirteen Orphans, Nine Gates, and the forthcoming Five Odd Honors. Although the main setting for these novels is the modern United States, I had a grand time weaving in elements of Chinese culture and cosmology. To answer the obvious next question… No. Pearl Bright, the Tiger of the Thirteen Orphans, isn’t me, but there are times I wouldn’t mind being her. This past weekend we went hiking with our friends the Lattimore Family and Joan Saberhagen in one of Albuquerque’s gems: the Rinconada Canyon section of Petroglyph National Monument. Wait! Before you run screaming, this is not going to be another description of the New Mexico landscape. At least not too much so. However, those of you who have read my fiction have probably already figured out that I like both archeology and being outside. Going hiking to various archeological or historical sites combines those interests nicely. My interest in archeology pre-dates my marrying an archeologist. I had the idea for The Buried Pyramid (which is set in 1870’s Egypt) long before I knew Jim as more than a guy in my gaming group. However, I must admit that knowing Jim and living in New Mexico have given me opportunities to nourish my interest. Petroglyph National Monument has three sections and, although Jim and I have hiked all of them repeatedly, Rinconada Canyon is our favorite. The petroglyphs in all three areas are both prehistoric (that is, pre-dating European contact) and historic (post-dating European contact, but excluding modern graffiti). The petroglyphs themselves are evocative and often religiously symbolic: masks, hand prints, bear paws, snakes, stars, cloud terraces, shield figures, and even full masked dancers. Although The Buried Pyramid is the only one of my novels to be built around my interest in archeology, several of my short stories have permitted me to explore my interest. “Hell’s Bane” in the anthology Battle Magic is set in large part right in Rinconada Canyon. It also features the Three Sisters, as the dormant volcanoes on the western edge of Albuquerque are known. “Jeff’s Best Joke” in Past Imperfect is the only story I’ve ever written where people I know are the main characters: in this case, my husband, Jim, and his frequent co-director, Jeff. You might say I couldn’t separate the archeology from the archeologists, but it would also be accurate to say I couldn’t separate the tricksters from the tricks. “Out of Hot Water” in Earth, Air, Fire, Water also owes quite a bit to my knowing Jim. It’s set in the Ojo Caliente valley where he directed a project, and where I went out and volunteered several times – mostly by taking notes to free up the more skilled folks to dig and map out grids. History and archeology are sides of the same coin. “Three Choices: The Story of Lozen” in New Amazons expands on the true story of the Apache war chief Victorio’s sister, Lozen. My forthcoming story, “Like the Rain,” in Golden Reflections is based on the Pueblo Revolt of 1680. Archeology doesn’t need to be “real” to show up in my writing. “Ruins of the Past” in Far Frontiers and its sequel “Lies of Omission” in Silicon Dreams are pure science fiction – and yet are inspired by my pleasure in reading about the great archeological discoveries of the past. So when I go hiking, I never quite know what I’ll discover. Archeologists walk through landscapes that combine their interest in the present and the past. Writers walk through landscapes that are both present – and are not. The South Trail up Tomé Hill is only a quarter mile long but mounts 1,200 feet in that short distance. The excellent brochure supplied at Tomé Hill Park at the start of the trail refers to the climb as “somewhat steep and strenuous.” That’s an understatement, especially at a mile high elevation, especially when breathing is already a touch problematic courtesy of allergies. I made that climb this weekend with my husband, Jim, and our friend Michael Wester. It was a beautiful day, clear and bright, with a light breeze holding just a kiss of winter chill. 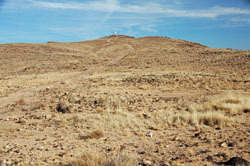 Tomé Hill (pronounced “toe-may”) is south of Albuquerque, near the town of Los Lunas. The hill is volcanic in origin. It stands by itself, surrounded by mostly flat plains, drawing attention, even in an area framed by much larger mountains. It has been a place of pilgrimage from prehistoric times, a tradition that continues through the present day. The South Trail is technically packed sand but, as I carefully placed my feet, I wasn’t looking at the sand, but rather at the myriad small and not so small rocks underfoot. Most of these were quite rounded and those that were not rounded were wobbly. When I realized that I was spending most of my time concentrating on my footing or on catching my breath, I decided that I needed to take time to enjoy what I was doing. What could I see from the south face? Other than a herd of black Angus cattle, not much was moving. The whine of a circular saw blended with the lowing of the cattle. Otherwise I could have been looking at a painting. Turn and climb, maybe another thirty paces. Jim is up ahead, forging on, using short, tight paces, his skill honed by years of walking archeological survey. Michael is somewhere off to one side. I stop and look down again. To my astonishment, thirty paces on this steep trail has changed the vista completely. Now I can see several more ranches. In one, three horses are pastured. As I watch, four riders come by, pacing the pasture’s fence line. The pastured horses amble over to say “hello.” The sounds have changed, too. An ATV is tearing up the hills to the southeast. A raven soaring below us calls to some friends in the cottonwoods. Another thirty paces. Another. Each time, the vista alters. At last the trail evens out as we parallel the crest. Now we can see all around us. Near the base of the hill on the west are some very elaborate houses. Further away are some small towns, clustered as if in memory of the Comanche and Apache who raided through this area in the not-so-distant past. Scattered around the crest is evidence of the many religious traditions that have used this for their ceremonies. Prominent are three enormous crosses, smaller crosses near their base. Jim points out some clusters of rock that are probably prehistoric Pueblo Indian shrines. Pecked into the basalt are petroglyphs, some quite ancient, others relatively modern. Eventually, we make our descent along the more easily sloping western trail (also called “The Way of the Cross” for its role in Christian celebrations). A cluster of basalt boulders conceal more petroglyphs, reminding once again how many traditions have called this way sacred. The sun is getting lower as we examine these, marveling how even a slight change of angle can make an image vanish. Sandhill cranes cry out, sounding rather like chickens. Below us in one of the pastures, a pick-up truck trundles toward some cattle (Hereford, I think) who had been lolling under a cluster of cottonwoods. The cattle, knowing their dinner is in that truck, rise and chase the truck back to the opposite side of the field. It’s funny to see such heavy animals running – the calves are particularly adorable, all long legs and knees. We continue our descent, having climbed Tomé Hill up and around ‘til the cows came home. Tome Hill West Trail — the easy one.